New Orleans Police Department Superintendent Ronal Serpas signed an agreement this morning with Independent Police Monitor Susan Hutson to share department information. The agreement, signed at the City Council’s Criminal Justice Committee meeting, means the monitor’s office will have access to the department’s information, be able to collect and analyze data, monitor investigations into officers, attend disciplinary hearings, and monitor critical incidents. The office is independent from the city, funded through Inspector General Ed Quatrevaux’s office. “This is a new day in New Orleans,” Quatrevaux said. Jasmine Groves addressed council. She is the daughter of Kim Groves, a mother of three who was shot in 1994, 48 hours after complaining to the police about Officer Len Davis, whom she had watched pistol-whipping a young man in her neighborhood. 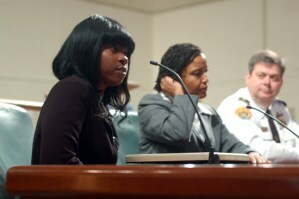 Groves (left, holding a framed picture of her mother), with Hutson (center) and Serpas (right). Serpas joined in a standing ovation for Groves after she had spoken. Davis got his associate, Paul Hardy, a drug dealer, to kill Kim Groves, and remains on death row as a result. Hutson said the agreement is designed to catch officers like Davis and Dwayne Scheuermann, the lieutenant indicted in the death of Henry Glover, an Algiers man who was allegedly shot and burned by police in the aftermath of Hurricane Katrina. The trial is ongoing in U.S. District Court this week. Serpas said he’d talked about the Len Davis story all over the country, as something that other departments should learn from. “We should not think that just because an officer appears to be working good, he’s working good,” Serpas said. Hutson said the aim of her office is to reverse the community fear engendered by cases such as these. “During my selection process, I heard over and over and over again how afraid people were to file complaints,” Hutson said. The monitor’s office aims to provide a trustworthy complaint process, monitoring the department’s early-warning system to look for patterns in risky behavior, and making policy recommendations and reform suggestions. The office has also hired a community outreach specialist to explain the process to the community, too. Hutson said the agreement could help improve the department’s image across the country. She has heard negative things at police conferences she has attended, she said. The monitor’s office has already helped the department revamp its use-of-force policies, and impose timelines on its investigation policies. In the future, it wants to look at racial profiling, retaliation investigation, and Fourth Amendment training, Hutson said. “This department has moved from being, perhaps, reticent, to being open, transparent and collaborative,” Serpas said. Serpas said he wanted officers to feel comfortable filing complaints against their fellow officers. The chief has received more than 100 phone calls where officers have reported suspicious behavior of other officers, he said. The committee co-chairwomen agreed that the agreement is a big step forward. The Lens asked for a copy of the agreement and will update this post shortly, once the monitor’s office has sent it along. Criminal justice reform advocates were enthusiastic about the agreement, but sounded a note of caution. Davis was one of the most decorated officers in the police department, Howell said. “Every 10 years the feds come in and prosecute, and we have failed to make the cultural changes to stop these things happening,” Howell said. Ronald McCoy from Safe Streets Strong Communities said the police are still behaving differently in Uptown neighborhoods compared to poorer areas of the city. Correction: An earlier version of this story mistakenly reported that the deputy had a court appearance on Monday. In fact, the District Attorney’s Office has until Nov.